Now that I have officially moved on from my old job and am working in the design studio I am feeling refreshed and good about life. However, I’m vividly aware that the tradeoff for happiness is money, and so with much less money coming in I’m worried we’ll starve. We absolutely won’t, but let’s just take a moment to understand my brain. When I was a kid my parents took me on vacation and bought me an amazing pair of stonewashed jeans with a button fly, reminiscent of the ones worn on Madonna’s Like A Prayer album cover. I was in love with them — for about 10 minutes. Soon after we exited the clothing store with my coveted jeans in hand, we went into a luggage store. There Mom and Dad bought a luggage set, which in my young mind seemed like hundreds of dollars we very much didn’t have. And I threw a fit. I cried and demanded we take back my new jeans. I imagined our family being torn apart by a single frivolous clothing purchase. How could I let my parents give me something that would ultimately break us? Where would we end up living? How would we eat? And on and on. Mom had to take me outside the store and reason with me, trying to convince me that there was enough money in the bank to buy needed luggage and a special treat for me. Oh, but the guilt remained. I didn’t want to be held responsible for contributing to our family’s certain trip to the poor house. At age 10 I have no idea where I got this heightened sense of responsibility about money and completely incorrect information about our financial situation, but there it was causing panic and overwhelming guilt. Flash forward twenty years and that’s kind of the situation I’m finding myself in again. Except now it’s Regan calming me down, telling me we can afford both some organic chicken AND the ingredients I need to make bread. All of this is to say that I took this worried energy and turned out an amazing amount of food this weekend. Our freezer, fridge and cabinets are well-stocked and I’m pretty sure we’ll not be going hungry any time soon. In fact, we’re probably going to have to start bringing food to friends because we have more than we need. And upon looking at our finances again (and again and again), we’ll be just fine. Sometimes I have to go a little crazy before I return to normal. Where was I though? 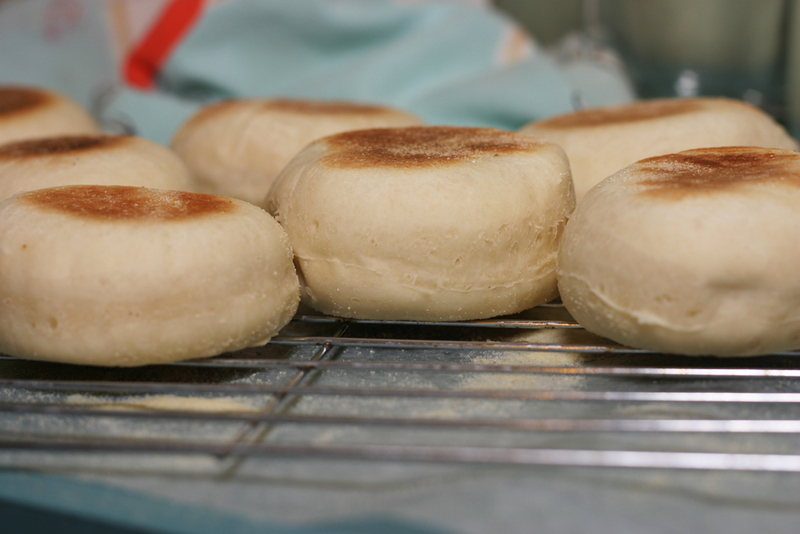 English Muffins! I made some this weekend and for the money it would take to buy a package in the store, we have 18. Most of them are in the freezer, but the rest are being enjoyed with butter and fig spread. There is something so satisfying about the process of making these muffins. 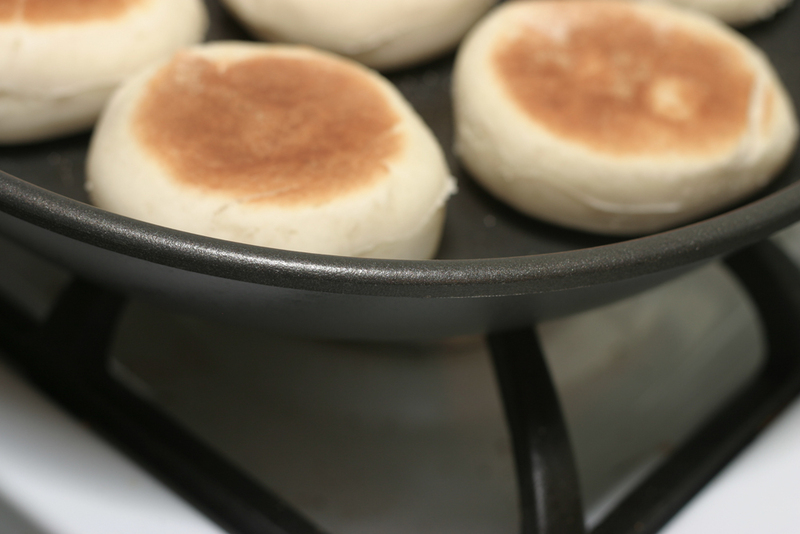 The dough is a perfect texture and they roll out beautifully. Cut gently with a lowball whiskey glass and placed on wax paper covered with semolina flour they steadily rise throughout the process. With each one I browned in the skillet, I got so excited about how much each looked like the store-bought kind. For some reason recreating what we know can be so satisfying. If you want to see for yourself how fun it is, I suggest using this recipe. They can easily be enjoyed with or without the crazy. Claire…. Dad and I are a little tight on money this month and need some English muffins to get us through. Can I come over and borrow some? 🙂 These look great and I am going to have to make some soon. I made a fiber breakfast bread yesterday and substituted so many of the ingredients that it didn’t look at all like the photo in the cookbook but tasted pretty wonderful — I used figs instead of raisins and slathered the fresh from the oven bread with lemon curd. Making it blew our monthly budget but the taste and the experience was well worth it! Yum! I’m having a love affair with figs lately. That sounds fantastic. Let’s have a bake off soon. Perhaps this phobia about money explains why you could not find a single item you wanted as a birthday present when we took you to Mall of America when you were elven or twelve. I remember this story! I bet most husbands wish their wives have your issue. Also, I think you’re just using being short on cash as an excuse to DIY instead of purchasing, it’s more fun and rewarding anyways. Check out this blog, it’s all about saving a penny! Ooh! Thanks for the link, Patti. Even though I’m all about being cheap I can’t seem to stop spending on food. I just love it so!